The Best Brakes In The World?! This VOLVO Truck Can Literally Stop On A Dime! - Muscle Cars Zone! The Best Brakes In The World?! This VOLVO Truck Can Literally Stop On A Dime! Are These The Best Brakes In The World? In this video, you can see how Volvo is maintaining its reputation as the safest car manufacturer in the world. Automakers have been making some pretty cool technology of late, and the Swedish manufacturer Volvo is definitely no exception. In the past decade, we have seen all kinds of modern features like a portable device integration, on-board Wi-Fi and automated parking. However, the technology that everyone are investing at the moment is autonomous driving. Volvo is definitely not idle on this subject. The company is constantly raising the standards with some cool autonomous features in semi-trucks. One of those features is emergency braking where Volvo might have the best brakes on the market. Just imagine a big-rig that is heavy loaded with cargo and is plunging down the road during heavy traffic. We wonder what could happen if the driver somehow becomes incapacitated or falls asleep. We guess this would result in a huge crash that will cause a lot of casualties. We have seen this happening a lot of times on roads across the world. However, Volvo Trucks has developed a very neat system that can prevent tragic accidents from happening with its ingenious Early Braking/Collision Warning system. 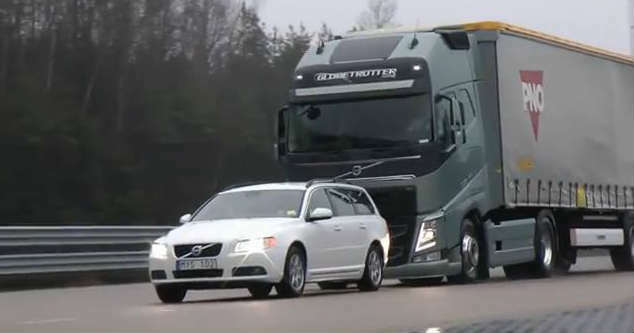 This state-of-the-art tech has been developed exclusively for Volvo big-rigs, and the result is staggering. Check out the video below and see the best brakes in the world for yourselves. Want to see the process of replacing brakes on a Ford F 250? Follow this link!